On Nov. 22, 2014, 12-year old Tamir Rice was in a park in Cleveland, Ohio with a toy gun. A person called 911 and told the dispatcher that the person was “probably a juvenile” and the gun was “probably fake.” The dispatcher did not relay that information over the radio. Officers Frank Garmback and Rookie Timothy Loehmann arrived and Loehmann shot Tamir Rice, who later died from the gunshot wound. The Cleveland police dispatcher who failed to relay all of the information was suspended for eight days. There were filings in court where a judge found probable cause to arrest Garmback and Loehmann, however, Cuyahoga County Prosecutor Timothy J. McGinty did not charge the officers and a grand jury did not indict. Tamir’s estate filed a federal lawsuit and the City of Cleveland settled for $6 million. The Cleveland Police Union has filed suit against manufacturers of toy guns seeking to have them redesigned. On April 25, 2016, the City of Cleveland agreed to pay $6 million to the family of Tamir Rice. 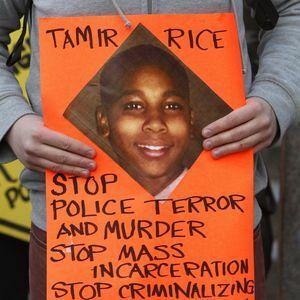 Twelve year old Tamir was killed by officer Timothy Loehmann on November 22, 2014. This case has been interesting and taken different turns in hopes that were betrayed. For example, after the prosecutor declined to charge Loehmann, a group of citizens filed affidavits pursuant to Ohio law R.C. 2935.09. Judge Ronald B. Adrine found that complaints should be filed with the prosecutor for probable cause against Loehmann for murder, involuntary manslaughter, reckless homicide, negligent homicide and dereliction of duty. Judge Adrine also found that complaints should be filed with prosecutors against Frank Garmback, Loehmann’s partner, for negligent homicide and dereliction of duty. Prosecutor Tim McGinty took the case before an Ohio grand jury who decided not to indict Loehmann and Garmack. McGinty called the killing of Tamir Rice a “perfect storm” citing human error, mistakes, and communications by all involved. McGinty failed to mention communication problems were on the side of dispatch and the officers. In November 2014, 12-year old Tamir Rice was killed by Cleveland police officer Timothy Loehmann just seconds after Loehmann pulled up to him. At the time of his death, Tamir was playing with a toy gun that was missing the orange warning tip that is supposed to identify it as a toy. The man who called 911 said that the gun probably wasn’t real, and the person with it was a kid. The dispatcher did not relay that however. After he was shot by Loehmann, Tamir was reported to the hospital to be a man in his early 20’s. Tamir’s family lived across the street from the park where he was killed. His 14-year old sister ran out to come to his aid, and could have given officers facts about his age had she not been handcuffed and put in the back of the police car and threatened with arrest unless she remained silent. Matthew Cicero, a five-year veteran of the Cleveland Metropolitan School District, accused the mother of the slain 12-year-old of being motivated by money. Matthew Cicero, who has worked as a Cleveland Metropolitan School District resource officer for five years, posted the comments several days after prosecutors declined to indict officer Timothy Loehmann, who shot and killed Rice within seconds of encountering the 12-year-old at a public park in November 2014. Officers did not administer first aid to the boy, and he died the next day. Cicero’s posts have been deleted along with his entire Facebook page, but were ABC-affiliate WEWS captured images. Cicero began his rant by blaming Samaria Rice of being a bad parent under an emoji that said “feeling annoyed,” according to screenshots posted by the station. What angers me is that there are separation of powers, and prosecutors are replacing the judiciary as interpreters. Judges have defined “reasonable” and that is also included in jury instructions in cases of this nature. Now, how can a prosecutor who has found that killing 12-year old Tamir Rice was reasonable, is going to be able to indict a ham sandwich before the grand jury? Two reports done by Cuyahoga County, Ohio Prosecutor Timothy J. McGinty found the shooting of Tamir Rice, by police officer Timothy Loehmann to be a “reasonable ” shooting. For those of you whom don’t remember, Tamir Rice was a 12 year old school kid, who was playing with a toy gun, when he was gunned down in approximately three seconds by , police officer Timothy Loehmann, who was responding to a 911 call about someone walking around with a gun. Ohio by the way is an open carry state. A grand jury will still have to make the final decision if charges will be brought against Loehmann. Wonderful and written from the human heart of divine wisdom. You put many things in words that I’ve found difficult to express. Thank you, Deborah. The Justice Department has reached a settlement with the city of Cleveland over the conduct of its police officers, according to a Justice official, the latest case in which the Obama administration has investigated excessive use of force and the violation of constitutional rights by a local department. The settlement, amid the growing national debate about American policing, is expected to be announced early this week, the official said. It comes just days after a judge acquitted a Cleveland police officer for his role in the fatal shooting of two unarmed people in a car in 2012 after officers thought the sound of the car backfiring was gunshots. The Justice Department in December issued a scathing report that accused the Cleveland Police Department of illegally using deadly force against citizens. The Justice Department’s civil rights division found that the Cleveland police engaged in a “pattern or practice” of unnecessary force — including shooting residents, striking them in the head and spraying them with chemicals. The police were also accused of repeatedly punching in the face a handcuffed 13-year-old boy who had been arrested for shoplifting. The Cleveland report was released the month after a 12-year-old African American boy, Tamir Rice, was fatally shot by a white Cleveland police officer. Cleveland officers had responded to a 911 call that reported a person pointing a gun. It turned out to be a toy pistol. A Justice Department spokeswoman would not comment on the settlement, which was first reported on the Web site of the New York Times. When last year’s report about Cleveland was released, then-Attorney General Eric H. Holder Jr. traveled to the city to announce the findings and said the Justice Department and the city had agreed to establish an independent monitor who would oversee police reforms. The changes will include better training and better supervision of officers, Holder said. There have been more than 20 investigation by the Justice Department’s Civil Rights Division in the past 5 years. The investigations have resulted in 15 agreements with law enforcement agencies, including New Orleans and Albuquerque. The Justice Department recently opened an investigation of the Baltimore police department. Here is the consent decree that the Cleveland police department entered into with the government. On a separate matter, I will be off and on today — probably offline more than on. Tomorrow, I might reblog some articles and unless something comes up that is really interesting, that might be the case for several days until I catch-up on some personal matters and begin feeling better. Remember to keep the Golden Rule.